Welcome to the pages of the VIRTUAL ARTIS AIRWAYS, a virtual, fictional, visionary and NPO, Non Profit Organisation, based on Trust, Fidelity, Professionality and Efficiency. We are sustaining the idea, that a successful flight requires an excellent information base, excellent flight planning, excellent aviation, excellent navigation, excellent communication and finally an excellent evaluative flightreporting/documentation. Periodically is the pilot performance development evaluation, with teoretical and practical tests, very appreciated! “Aviate, Navigate, Communicate (A-N-C), is a phrase that has been used by pilots for many years. It’s a reminder of the pilot-in-command priorities during emergency situations, and can be used as a guide to create training scenarios. We are flying to/from 6 + 1 CONTINENTS, EUROPE, NORTH AMERICA, SOUTH AMERICA, AFRICA, ASIA, AUSTRALIA, ANTARCTICA, with CHARTER, SCHEDULED & CODESHARE FLIGHTS. Our 21 Hubs (see under the main menu OPERATIONS the submenu AIRPORTS-PILOTS-AIRLINES) are distributed worldwide to cover the main stream of the traffic interests. Powered by the smartCARS virtual flight tracking and flight evaluating systems, we are able to fly and pireping our CHARTER, SCHEDULED or CODESHARE flights to the ARTIS AIRWAYS Headquarter. The CHARTER Flights are divided in Subcategories like 1 = EXECUTIVE, 2 = GENERAL, 3 = AIRBORNE REPORTING SYSTEMS, 4 = ARCTIC RESEARCH SYSTEMS, 5 = ANTARCTIC RESEARCH SYSTEMS. … 9 = TRAINING. A large Fleet sustain our endeavour, deploying the ability to plan proficient and fulfil efficiently our online and/or offline flight operations. (see under the main menu OPERATIONS the submenu FLEET). We are working continuously on the further development and improvement of the ARTIS AIRWAYS organisation at all levels. After the succesfully registration as ARTIS Pilot, to become an active PIC Pilot in Command (see under the main menu OPERATIONS the submenu START), feel you free to start so quickly as possible after your tedious flight preparations, and keep in mind that we are learning also a lot “by doing”, autodidact and/or in teams! 4. Exceeding the roll angle limit of 5°. (exception is case of evidenced extreme weather situation, moderation is necessary)! 5. Not enough fuel for a safe stopover in emergency case! Be safe, proficient and efficient, as VIRTUAL ARTIS AIRWAYS PIC Pilot in Command, begining allways with a very good flight planning, first! Enjoy your position, in one of the worldwide best implemented and designed Virtual Airline for virtual professional pilots! The Staff Team of ARTIS AIRWAYS GROUP wishing you a very good flight preparation, enjoying with much fun the safest flights and the safest happy landings at your destinations! 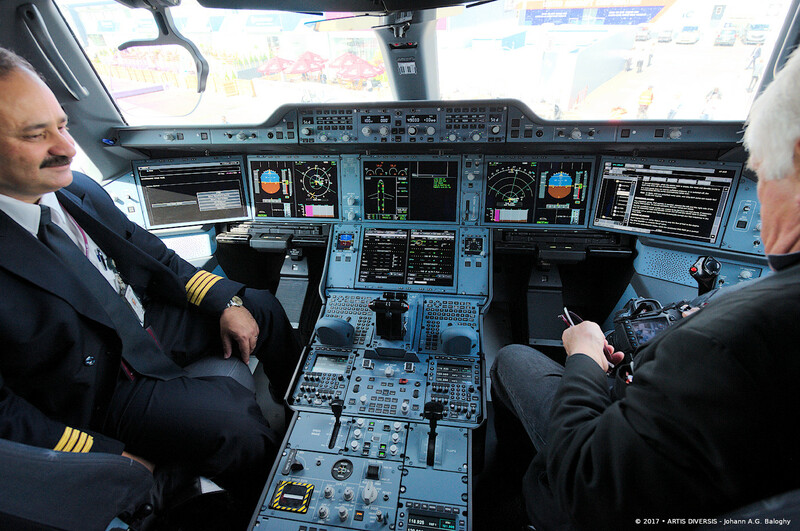 THE CAPTAIN AND THE JOURNALIST IN THE A350-900, AT THE AIR SHOW PARIS 2015 – © 2015-2019 • ARTIS DIVERSSIS – Johann A.G. Baloghy – © 2019 • Artis Airways.